In honor of the association’s Founder Ward J. Anderson, the Great Lakes Ice Cream +Fast Food Association sponsors the Ward J. Anderson Scholarship Program. Scholarships are awarded annually to student employees of its members. Eligible applications are read and scored by a committee of three (3) Board of Directors. The association invites the scholarship winners and their sponsor to the Founder’s Banquet Dinner at the Annual Convention and Trade Show to honor them and to receive their scholarship certificate. Since 1990, over $180,500 in scholarship monies have been award to student employees of its members. 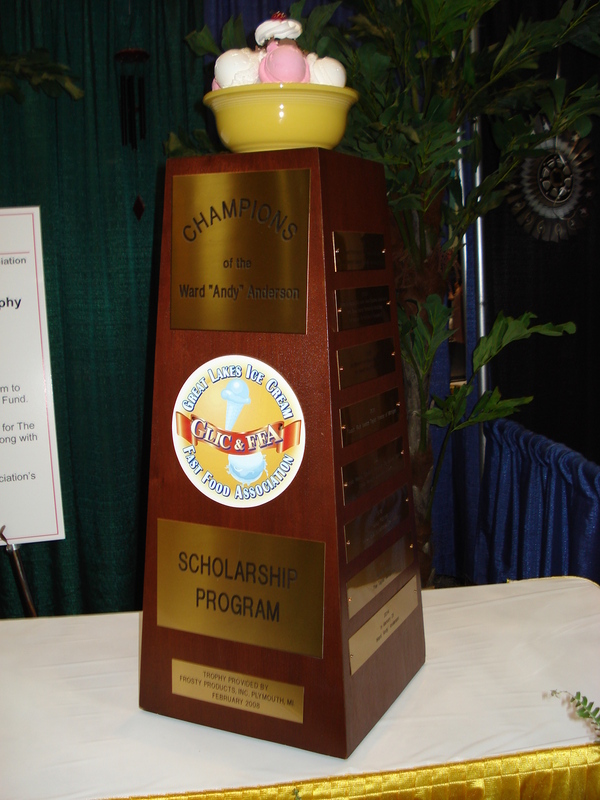 The Ward “Andy” Anderson Champions of the GLIC+FFA Scholarship trophy was introduced to the Association membership at the Banquet Dinner during the 2008 Convention and Trade Show. The idea of a recurring auction item to support the scholarship program has been thought about by Association members for a few years and with thanks to Suppler member, Frosty Products. “The Andy” was conceived, custom built, and donated to the Association. The trophy is constructed with a huge custom ceramic bowl of ice cream on a walnut base and stands over three feet tall. There is room for inscriptions to honor each year’s Champion for the next twenty-four years. At the first year’s live auction, conducted by Mel White of Mel White Appraisers/Auctioneers, “Coach” Rick Senica of Taylor Freezer of Michigan and “Meema Fabulous” Lynda Utterback of The National Dipper magazine bid a combined bid of $3,100. The highest bidder each year receives their name, their company, and year inscribed on a brass plate on the trophy. Since its inception, “The Andy” trophy has raised $28,689 in scholarship monies.